Most of the time I hear someone say they’re going through a swing change, they found something by accident at the range that let them hit three balls in a row better than they ever have and the Key To Golf is now theirs if they can remember what it was and put in the time to install it in their swing on top of all the other things that aren’t helping them. I know. I used to be that golfer. I would find a little thing, and think, “This is it!” My sons wish they had a nickel for every time I told them I was working on a new swing technique, no, this time it’s really different, etc., etc., etc. What it was, was just noticing something I had been doing all along, overdoing it, and finding that it didn’t work anymore. I must have gone on like that for a dozen years. I got better, but not that much better. My Swing of the Week didn’t do much for my confidence, either, since I never knew which swing I would be taking to the course, and what do do when it stopped working. So I decided to jump ship. I had some lessons in which my pro set me off on a new direction and changed me into a different golfer. That was in May. I stopped playing golf to work on this. There were a few serious rounds in which my short game saved me, and weekly rounds with my grandson batting the ball around the local 9-holer, but it was mainly practice, practice, practice. This change went through three distinct phases — what the pro taught me, how I made it my own, and how I settled back into my old swing but with this modification. That’s what you have to do. There’s only one way you know how to swing a golf club, one way that makes sense based on your build, your strength and flexibility, and your internalized conception of physical movement. All that defines how you will swing the club. It is up to you to learn the correct principles of swinging a golf club and interpret them through those things I listed that make you the athlete you are. 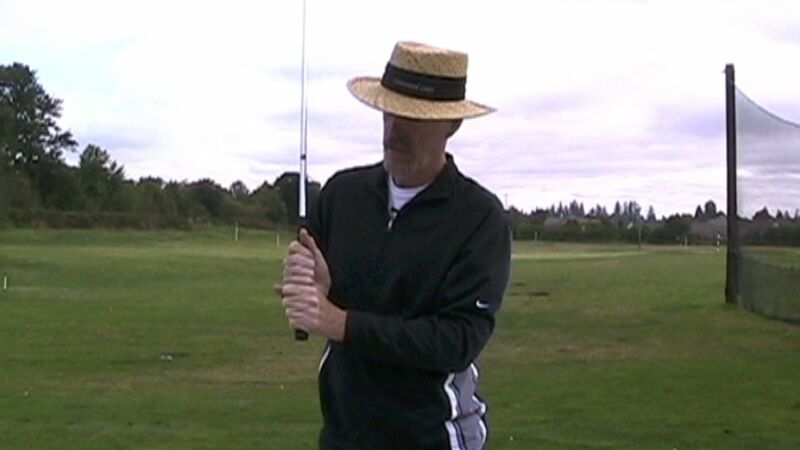 A real swing change is a major commitment and takes time, thought, and continual practice to adopt. First you have to make sense of what the heck you’re supposed to be doing. Once you get that down, you have to figure out how to swing and do that new thing at the same time. Believe me, that’s not easy. Finally, once you can swing with the change, it’s still a studied motion, so you have to ease back into the style of swinging that feels natural to you, but with the new technique in place. It takes guidance a long the way. I have had two more lessons in just this thing, to make sure I’m doing it right and to correct a few matters that came up. I haven’t hit 10,000 balls along the way, but about half that, yes. I hit five times a week and swing the club every day. Where at first it felt quite strange, and I could do it only with my 9-iron, this change now works throughout the bag. Th current task, since the guess-work and probing and trying is over, is getting in the reps to make it an unconscious habit. I should be ready in a few months. Definitely, by all means, go through a swing change. But do it under the direction of a pro you trust, and be ready to put in serious time working on just that one thing. It’s worth it. Several years ago, when Annika Sorenstam was on the LPGA tour, she was in Portland for the Safeway Classic golf tournament and was being interviewed by a local TV talk show. The host asked her, “Annika, do you ever hit it fat? I mean, just turn up some sod?” and she answered, “No.” Not, “No, I haven’t done that since I was 13 years old.” Just, “No,” and then looked at the interviewer for the next question. For us, it’s not No. It’s once or twice a round, and if you really wanted to cut it fine, we probably hit a little bit behind the ball on every swing. I’m not kidding. The pros start their divot in front of the ball, but we do that once in a blue moon. Don’t believe me? Try this. Go to the range and hit from the grass tees. 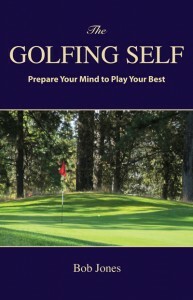 Lay a tee on the ground, on its side, pointing at the back edge of the golf ball. Take a few practice swings with your 7-iron. Now hit the ball. I will bet you dollars to donuts that the divot started behind where the tee is pointing. Hitting behind the ball is your standard shot. Let’s fix that. There are many reasons why you hit behind the ball. We’ll deal with a big one here, that your weight is staying on the right side during the downswing. (A left-hander’s version of this post is found here.) That is, your weight shifts a bit to the right when you take the club back, but stays there was you’re swinging through the ball. Result, the bottom of your swing shifts to a point behind the ball. Fat city. Here’s the easy cure, and I do mean easy. When you take your backswing, the weight on your left foot shifts to somewhere around the big toe. The first thing you should do on the downswing, according to Harvey Penick, is shift your weight to your left foot and bring the right elbow into your body. Let’s concern ourselves with the left foot. There’s a problem with that instruction, in that it’s incomplete. You can put your left foot down and still not have your weight shifted onto it. To be sure you get that weight left, put your left heel on the ground, and even finer, the outside of your left heel. If the outside (surface, not edge) of your left heel is pressed against the ground, your weight has to be left. You cannot keep your weight to the right and do this. Practice to move the weight smoothly onto the left foot at the big toe or thereabouts (at the top of the backswing), then to the outside of your left heel when you start your downswing, and the fat shots could well disappear. Other reasons why you might hit fat are that you either cast or flip. We’ll go over those another time. The grip is the first fundamental of golf. Get a good grip and building a good swing is much easier. Read about it, or see the video. 1. Every golf book talks about how to take your grip by showing you how the club lays across the palms of your hands. Try building your grip by looking at the back of your hands. Your fingers have three rows of bones in them, called phalanges. In the left hand, the relevant section is the proximal phalanges just above the back of the hand, where the fingers attach to the hand. For the right hand, the relevant section is the medial phalanges, the middle section. The third section, distal phalanges, where the fingertips are, is not relevant to the grip. Now slip your left thumb into the pocket formed in the palm of the right hand. Finally, lift up your right little finger and slide your right hand down, placing the little finger on top of the left index finger, or between the left index and middle finger. There’s your Vardon grip. Lining up the bones locks your two hands together without having to press them together. If you hands come apart even a bit during the swing, the clubhead turns and accurate contact is lost. This is the way to prevent that from happening. 2. Hold the club at its balance point. If you feel around about an inch from the top of the handle, you will find a place where the clubhead feels like it is an extension of your right hand. Above this point the club feels whippy. Below this point, the club feels stiff. In neither case do you feel connected to the clubhead. Be sensitive in finding this balance point. Sometimes moving your hands just a quarter of an inch up or down the shaft makes the difference. By holding the club here, it will feel like a tool in your hands ready to do your bidding. In review: Line up your knuckles, and find the balance point. This is how to make your grip work for you. Announcement: On Thursday, August 18th, I recorded my 10,000th page view. Thank you for your support. You were expecting a post on a different subject today. But I try to be topical, and since I went to the LPGA tournament yesterday, I thought I’d talk about that. I took my grandson. I wouldn’t have gone otherwise. He plays golf with me. I’m a 9, so I hit shots good enough to be a 9. Believe me. My good shots are nowhere near what a professional golfer’s good shots look like. He needed to see what a good golf shot really looks like. We got to the course at about 10:30, and the morning wave had all teed off. We picked up a few unknowns and followed them for a few holes and by chance ran smack into Ai Miyazato, Vicky Hurst, and Anna Nordqvist going the other direction. So of course, we switched to following them. Miyazato turned a drive that would have given me a double bogey into a routine par, Norqvist sank a birdie putt from downtown, and Hurst, well, she wasn’t having a great day. Later we saw three players about 70 yards away on a par 5 all put their pitch birdie-close to a tucked pin. That was impressive. I also noticed the around the green, the players kept the ball on the ground hitting it up to the pin. No flying it up there with a lob wedge. Ground all the way. We saw players who had it clicking and players who were just that much off that the strokes were piling up. There are so many golfers and the course is so big, you can’t see everybody. We did have a chance to see Morgan Pressel, Grace Park, and Suzann Pettersen play a few holes. Park and Pettersen were doing well, Pressel wasn’t, long story short. I noticed that Pettersen moves her head all over when she putts. Maybe that’s why she isn’t making those 8-10 footers in the crunch. As for Grandson (age 12) he followed with interest for a while, then made a golf club out of the foil wrapper his hamburger came in, a sign his interest had faded. We made our way back to the clubhouse, watched the last of the afternoon wave warm up on the range (a succession of easy, unforced swings), headed out toward the parking lot, pausing to watch one group tee off, then went home. An airport nearby has an annual air show on the same weekend as the tournament, so Grandson was fascinated by the aircraft flying over, especially the F-15s. Try putting with all that racket sometime. We got caught in Friday afternoon traffic on I-5 coming home, so a long day ended up being a bit longer than we had planned on. We both had fun watching the golf and with each other, though, so I think we’ll be back next year. My father took me to see the Portland Open Invitational in 1959. Billy Casper won, and I got Arnold Palmer’s autograph. That was before he was really Arnold Palmer, when he signed for me it was just the two of us. I still have vivid memories of that day, which I might share with you sometime. I don’t know what of today’s trip got into Grandson’s head, but I gave him the exposure, and no doubt it is something that he will remember forever. 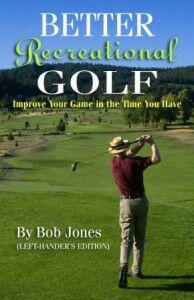 Just for fun, pop over to www.therecreationalgolfer.com for tips and the best book on recreational golf you have ever read. If you’re a recreational golfer, that is, not a golfer who is trying to win tournaments, but someone who just wants enjoy yourself in the out-of-doors with your friends, try these five ways to make golf more fun. 1. Play from the right set of tees. 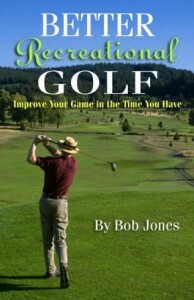 Almost every recreational golfer plays a course that is too long, and therefore too difficult. Multiply the length of your average drive by 25. That product is the length of the course you should be playing. Be honest with yourself about how long your average drive is. It’s about 95 percent as long as your best drive. For example, if your average drive is 220 yards, and that’s not bad, you should play a course that is 5,500 yards long, not the 6,400-yard monster that you’re playing now. You’ll have more short irons into the par 4s, you’ll make more pars and maybe a few birdies . . . and have more fun. 2. Play scrambles. This is a match where your foursome divides into two teams. Each player on a team hits off the tee, then the best tee shot is chosen and both players hit from there. After every pair of shots from the same location, the best shot is elected and the two partners play from there, all the way into the hole — even on the putting green. This game makes golf a little more social, because you have partner helping you with your score, and your bad shots are forgiven. That last part is really more fun. 3. Throw away the scorecard. Play a round where you don’t keep score. Just hit the ball into the hole and move on to the next tee. Too often we get anxious about the shots we have to hit because of how they might affect our score. The score is just a record. Don’t let it become the reason we play. Try once just playing. Don’t count your strokes, don’t even keep track of them in your head. Give up the score. You might find that alone releases a lot of worry and makes the game a lot more enjoyable. You don’t always have to be competing with someone or with yourself. Sometimes, just play. 4. Lighten your load by playing with fewer clubs. You don’t need three woods, seven irons, three wedges and a putter to move the ball around the course. What you do need is a club to hit off the tee with, a long club and a medium club for the fairway, two wedges, and a putter. That’s six. With that set, you can solve any problem the course throws at you by being creative, and making yourself be more creative is, well, more fun. What about your score? Won’t it go up if you don’t have all your clubs? If you try this, you might notice that with this abbreviated set your scores stay pretty much the same as the ones you get with the full set. 5. Play golf with your children or grandchildren while they still are children. You give them a lifetime gift, and your time on the course together will build a personal relationship with deep roots. What more needs to be said? If you play golf for fun, play it so it is fun. We don’t have to play the game tournament professionals play. Being ourselves, recreational golfers out for a good time, is enough. Now that the four major tournaments have been completed, we can start talking about who is likely to be the PGA Player of the Year. Because no one player has been truly dominant, it’s a difficult decision to make. We should start the discussion with who won the major tournaments. The major title winners this year are Charl Schwartzel, Rory McIlroy, Darren Clarke, and Keegan Bradley. Clarke and McIlroy aren’t members of the Tour, so they’re out right away. Schwartzel won the Masters, and finished no worse than 12th in the other three majors. Bradley won the PGA, but wasn’t qualified for the other three. In the past twenty years, only three players have won POY without winning a major title. Greg Norman in 1995 and Corey Pavin in 1991 won the award and were the Tour’s leading money winner. This year the money leader is Luke Donald, with Nick Watney close behind. Schwartzel is currently #20 on the money list, and Bradley is #6. Multiple Tour winners? Jim Furyk, the third non-major POY winner, won the award last year for winning three tournaments, including the Tour Championship. This year’s multiple winners, each with two, are Mark Wilson (13), Bubba Watson (9), Steve Stricker (4), Watney (2), with current money list places in parentheses, and Bradley. Donald has won twice in Europe, but that won’t help him here. He won once on the PGA Tour and has been world #1 for eleven weeks. Stroke average? In order, Donald, Stricker, Watney, Garcia (! ), and Schwartzel. This has never been the deciding factor, but it does add validation to the other criteria. Those are all the objective standards we can haul out. If you want to add charisma, McIlroy wins hands down, but again, he’s not a member of the Tour. Who we are left with are Bradley (two wins + PGA), Donald (one win, W#1, leading money winner), Stricker (two wins, #4 on the money list), Schwartzel (Masters), and Watney (two wins, #2 on the money list). Watson, and Wilson, nope. Stricker, Schwartzel, and Watney are having good seasons, but that’s it. It looks to me like a contest between Donald and Bradley, with the edge to Donald because of his year-long consistency and assuming W#1. Of course, someone could get hot in the FedEx Cup series and shake things up. Normally I don’t care very much about this desperate exercise to compete with the NFL and NASCAR that only Tim Finchem and Kelly Tilghman love, but this year it might actually mean something. Everybody loves Gary McCord. He is the tournament announcer who always sees the odd view, who isn’t afraid of making the loopy comment that everyone is thinking, but no one will say. Everybody loves him. Well, may be not the stuffed shirts who run The Masters tournament, who objected to him talking about greens that were so slick they had been bikini-waxed, and about a spot behind the 13th green where they find the body bags of golfers who hit the ball there. I mean, Augusta is more holy to golf than the Vatican is to Catholicism. How dare he? He dares because he’s Gary. But that’s not all Gary McCord is. He is a guy whom every Tour player should tithe one percent of their winnings to. He, not Tiger, and made the tour the lucrative profession that it is. Gary McCord is one of the top five most influential persons in the development of the PGA Tour. Why? He was the prime mover in creating the all-exempt tour, which changed everything overnight. Here’s what that means. In the early years of the PGA, all you had to do to play in a tournament was show up and pay the entry fee. If you were unknown, having another pro vouch for your skill established your credentials. Starting in the late 40’s, more golfers wanted to play than there were spots in the tournament. Patently unqualified golfers tried to compete. That demanded Monday morning qualifying rounds to be played, the highest finishers given entry to the tournament staring on Thursday. For a while, that system worked, but is was a brutal entrance to the Tour for golfers who might might be bounced on Monday and have to wait around seven more days to try again. For golfers who passed Monday qualifying, making the tournament cut meant they were eligible for the next tournament. Miss the cut, and we’ll see you again on Monday morning. So many golfers were knocking on the Tour’s door, that a qualifying program began in 1965. Called Q School, the survivors were the ones who could play on Monday mornings. It worked for a while, but the Tour grew to the point where in the early 1980s, 68 percent of the Tour players were non-exempt. They had to Monday-qualify to get into tournaments. Also the Monday qualifiers, called “rabbits,” played very conservatively in order to just make the cut. They weren’t learning how to play to win. Joe Porter, a one-time Tour pro, had, along with Phil Rogers and a few other pros, come up with the idea of an all-exempt Tour in 1973. Gary McCord called Porter in 1981 and said something had to be done. The two discussed the all-exempt idea, and McCord was off to the races. He floated the idea to the membership of an all-exempt Tour, got the sign-off of both the big stars and the rank and file, and presented the proposal of a 125-player exempt list to Tour Commissioner Deane Beman. It was approved for the 1983 season. Now players finishing Q-School would have an entire year of tournaments they could enter at will to retain and secure their playing privileges. No more Monday qualifying. Though the idea wasn’t McCord’s originally, this guy, who is a lot smarter than people think, or than he wants people to think, was the prime mover behind it all. On the air, he displays the mind of a man who sees the world differently than the rest of us. But then, it took that kind of mind to see this task through. If he doesn’t end up in the Golf Hall of Fame, there’s no justice in the world. The final major of the year starts tomorrow. The one that gets too little respect, in contrast to the first one, which gets too much. Even I think that the golf season is essentially over after the British Open, but that’s mainly because I’m starting to get amped for the college football season. The question, as usual, is who is likely to win. For the past three years, predictions have been pointless. A different player has won each of the last 12 majors*. The last six have been won by a first-time major winner. Given the parity that exists in men’s golf today, the answer to the question, Who is the best player to have never won a major, is, Everybody. At the top right now, we have Luke Donald, a consistent player, but not an intimidator, Lee Westwood, who always finds a means of getting in his own way, Adam Scott, who might finally be coming into his own, and Jason Day, who keeps coming close so often that he has to have learned how to break through. Personally, I would like to see Westwood take the trophy. I’m a sucker for the comeback story. Here is a guy who was the Next Big Thing for a few years and whose game just collapsed. He worked his way back with a swing that is the antithesis of the cookie-cutter swings on the Tour today. It looks homegrown (though it’s not) in the way he just seems to rear back and whack it. Through all his disappointments in recent majors, he has never complained or made excuses. That means a lot to me, too. The Championship will be played on the Atlanta Athletic Club course, the site of two memorable major wins. The first one was when Jerry Pate won the U.S. Open there in 1976. He came to the 72nd hole with a slim lead and a 5-iron to a pin next to water. Commentators were discussing whether he should go for it or lay up. I thought to myself watching on TV, “If he wants to be a champion, he’ll hit the 5.” He did, and won by two over Al Geiberger and Tom Weiskopf. The next one was the PGA in 2001, when David Toms came down the same fairway and had the same dilemma. His tee shot was farther from the green than Pate’s was and I was thinking. “If he doesn’t lay up, he’ll throw it away.” He chose to lay up, then pitched over the water to eight feet and sank the putt to beat Phil Mickelson by a shot. I should be a Tour caddy. The course will be 254 yards longer this week than in 2001, with all but 33 of the additional yards being added to the first four and last four holes. The 6th hole has a pond fronting the green that is new. It will reign in long hitters when the hole plays as a 425-yard par 4, and be a risk element when the hole plays at 296 yards. Jerry Pate hit his 5-iron on an 18th hole hole that measured 460 yards. David Toms’s 18th was 30 yards longer at 490. This weeks it will be 507 yards long, with more trouble around the green than before. If you play a drinking game where you have to down a shot every time someone goes for the 18th green in two, you’ll finish the day stone sober. The weather forecast is for low 90s heat and near-60% humidity. There will be a lot soaked shirts by the third hole. This one could be fun. I’ll be watching. When it’s over I’ll be heading to Pre-Snap Read for the last three weeks before the college football season starts. FedEx Cup? Are you kidding? *In order, staring with the most current winner: Clarke, McIlroy, Schwartzel, Kaymer, Oosthuizen, McDowell, Mickelson, Yang, Cink, Glover, Cabrera, Harrington. Note: only three Americans in the bunch.